One of the highlights of the last few weeks of the 2018 vendanges was tasting the wines from 2017. A group of our friends gathered to enjoy bottles kindly given by Jeff and we tasted through them, scoring them as went. I am not a great fan of wine scores but it was a simple way of tracking our preferences, we revisited scores regularly to ensure there was some context for the earlier marks. We started with the OW of 2016, so a different vintage but yet to be released. I have tasted it regularly in recent weeks at vendanges lunches and I really like it. 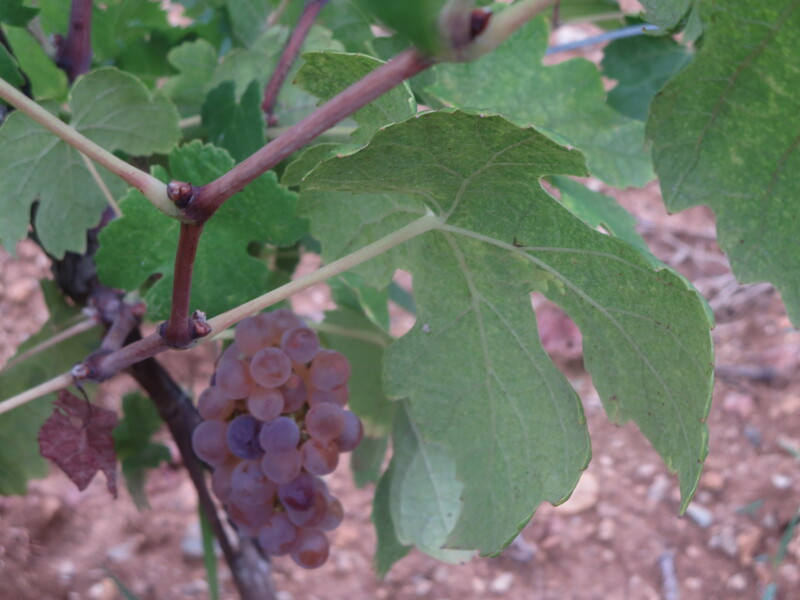 Many orange wines are being made but often they are based on grapes which have fairly neutral skins. OW is made from Muscat D’Alexandrie and the skins have a lot of flavour which the long maceration brings out together with the tannins. This has real character, one of my wines of the night. It must be said that for some of my friends it was too much of a shock, unused to skin contact wines they found it too different. If you like orange wines though, believe me, this is excellent. On to the reds. 2017 was a vintage of low yields due to the long, dry summer. However, it must be said one of the consequences is a concentration of flavour and high quality. The six wines we shared were all very good and consistent in their length and full flavour. Perhaps the most consistent of any vintage I have been involved with since I started in 2014. Vin De Table is a supposedly simple wine. Don’t be fooled, it is very good. Assembled from wines left over from the main cuvées with quite a large portion of Merlot for good measure. It received consistently good scores from everyone, it was simply enjoyable and very drinkable, belying its simple status with good fruit, freshness and length. A bargain at the price of well under 10€ seen in many caves. Tête À Claques was a wine originally made for London restaurants but now sold from the cellars. It is based on Le Vin Des Amis (what was left) to which was added Mourvèdre and other remaining wine. The Mourvèdre boosts the wine with some crunchy, dark fruit flavours and this was one person’s favourite wine of the night. The natural successor was Le Vin Des Amis. For two of the group this was their favourite wine of the evening. The 2017 version is based on Cinsault, not the norm. Blended with Syrah and Grenache the Cinsault gives a real lift of red fruit and the result is a classic VDA, a bottle which will please anyone and disappear quickly. On to the other headlining wine of the Coutelou range, Classe. Syrah, Grenache and more Mourvèdre (there was also a pure Mourvèdre released in 2017 under the name of On Peut Pas Vraiment Dire Que). Classe usually adds a depth and silkiness compared to VDA, it lives up to its name and label. This was no exception, it really is a very good wine and one I would love to age for a year or two even though it would be hard to resist now. One person chose it as their highlight. Flambadou has been one of the best wines of the domaine for the last few years. Pure Carignan from a vineyard with complex geology the 2017 version is up to those high standards with dark fruits, freshness and ripe tannins. It needs time to mature before it reaches its peak but this is one of my favourite wines and, from experience of this wine, I can tell this will develop into a top class wine. My absolute favourite Coutelou wine is La Vigne Haute, the pure Syrah from La Garrigue. North facing, villefranchien rock the wine is only released as La Vigne Haute when Jeff decides it is of the required quality, just seven of the last nineteen years. This is the first time I have been involved with making LVH and I am thrilled with it. The fruit is already evident, it is complex, has dark edges as well as the fruit. The flavours are long and fresh with more ripe tannins. It is a beauty, it could be mistaken for a wine from the Rhone or Ardèche. Previous examples of this wine have shown me that it needs 5 years or more to be at it best, 2009 is excellent at present. This will be a wine to treasure for years to come. Three of us chose it as wine of the night. Overall, my friends showed great taste in selecting La Vigne Haute as the clear leader in scoring (I hope my influence wasn’t too strong!). Classe and Le Vin Des Amis followed on a few points behind. However, all agreed as we enjoyed a wonderful half bottle of Vieux Grenache that the wines were excellent, consistently so. Thanks to May and Martin for being such great hosts and providing lovely food to accompany the wines. And to Pat, Afshin, Denise, Matt and Jonathan for joining in and making it so enjoyable. A special night. Jeff told me from the beginning that he makes his wines to be shared with friends and loved ones. This was a night to prove the wisdom of those words as well as the immense talent and passion of Jeff Coutelou. Categories: Tasting, Wines | Tags: 2017 wines, Carignan, Cinsault, Classe, Coutelou, Flambadou, La Garrigue, La Vigne Haute, Le Vin Des Amis, Merlot, Mourvedre, Muscat d'Alexandrie, orange wine, OW, Syrah, Tete A Claques, vin de table | Permalink. Last weekend I should have been in the Languedoc with Jeff and attending a wine tasting at Latour De France. Sadly, a 48 hour bug put a stop to that. Instead I reflected on a tasting we did at Jeff’s on October 3rd of all the 2017 wines in cuve. Regular readers will recall that they vintage is of high quality but low quantity. Quantities will be in short supply of what will be seriously good wines. There was a tinge of sadness about that as we tasted through the range. These were my notes on the evening. 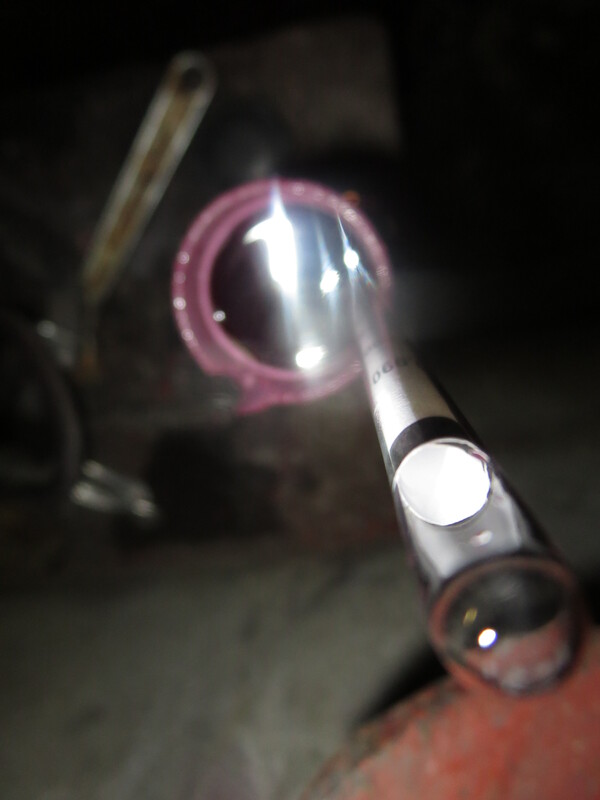 Maccabeu / Grenache Gris – still some residual sugar. Fresh nose, Fruity, pears. Slight sweetness which will disappear. Clean and lovely. Sauvignon Blanc – fresh apple, bright and zesty. A true Sauvignon character, refreshing. 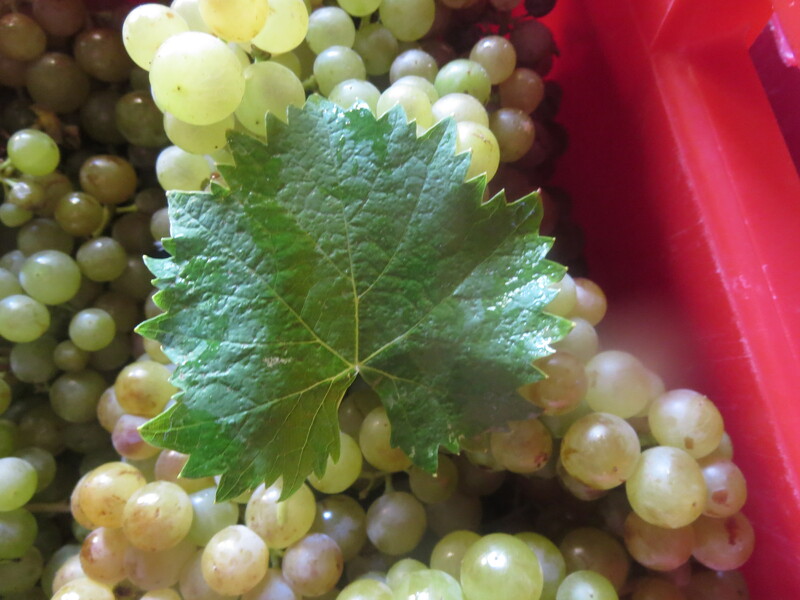 Carignan Blanc – lovely, full, clean, direct – fresh and fruity. Very good. Rosé – very pale, flowery aroma, fresh and clean, exactly what you’d want from a rosé. Syrah (Ste Suzanne) – whole bunch, red fruit, round tannins, good finish, full, very good. Cinsault – lovely, fresh and juicy red fruit, cherry, 13,5% but tastes lighter. Good. Syrah (Segrairals) – amazing passion fruit nose which carries into taste. Fresh, citrus and lovely red fruit, a real star. 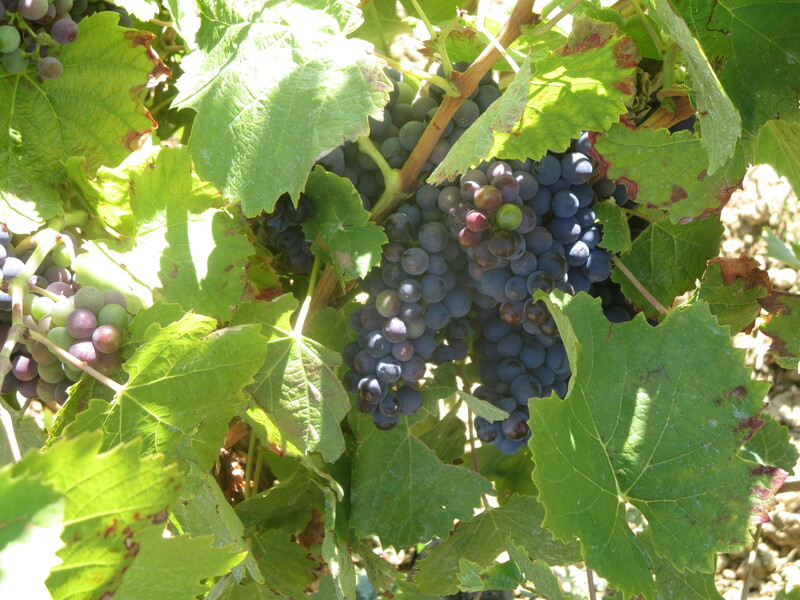 Syrah (La Garrigue) – La Vigne Haute (fingers crossed). Terrific, direct full tannnins, splendid fruit, full, long – stunner. Flower Power – Maccabeu, Syrah (St Suz), Grenache (St Suz), Grenache Gris, Cinsault, Terret Noir and Flower Power – Despite the different assemblage this has the character of previous Flower Power – fruity, silky tannin and very appealing. Lovely. Grenache – blend of Ste Suzanne / La Garrigue – 2015 St Suz provided 80hl, this year the 2 vineyards made 60hl. Lovely, fresh cherry flavours with a spicy finish. Mourvėdre – crunchy, spicy good tannins and dark fruits. Very true to the grape. Good. 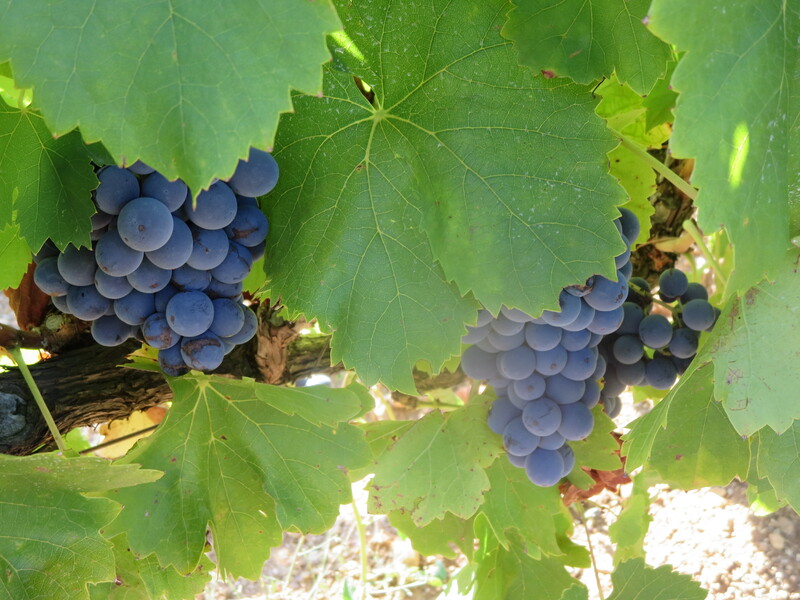 Carignan – top of the class. Lovely fresh red and black fruits, excellent balance of freshness and complexity. Star yet again. Merlot – lovely fruit nose, fresh, touch of wildness which should settle. Nice. Cabernet Sauvignon – still some sugar, plenty of fruit, easy to drink with classic blackcurrant notes. We went on to drink a couple of the 2016 wines which were still in cuve, a very floral and spicy Syrah and an assemblage of Grenache, Syrah and Mourvèdre which had good fruits with a soft tannin finish. Reflections on the evening? The quality of 2017 is clear it is up there with the 2015s, just such a shame that fewer people will get to drink them. The whites are very good but the reds shine especially the future La Vigne Haute and Flambadou. The wines had all fermented beautifully causing few worries. A vintage to cherish, can’t wait until it is in bottle. Categories: Tasting, Wines | Tags: 2017 wines, Cabernet Sauvignon, Carignan, Carignan Blanc, Cinsault, Flower Power, Grenache, Grenache Gris, Maccabeu, Mas Coutelou, Merlot, Mourvedre, Sauvignon Blanc, Syrah | Permalink. This chart was published two weeks ago even though the information refers to 2010. I found it fascinating (I am a sad case I understand). Some of the information would be expected, New Zealand with its Sauvignon Blanc for example, Australia with its Shiraz. I was rather surprised to see Merlot as 13.7% of the French vineyard area however. Admittedly this is partly because it is one of my least favourite grape varieties, though, as always, fine examples are available from good vignerons. Merlot, like Cabernet Sauvignon, Chardonnay and Viognier, were in vogue in the 80s and 90s when I became interested in wine. 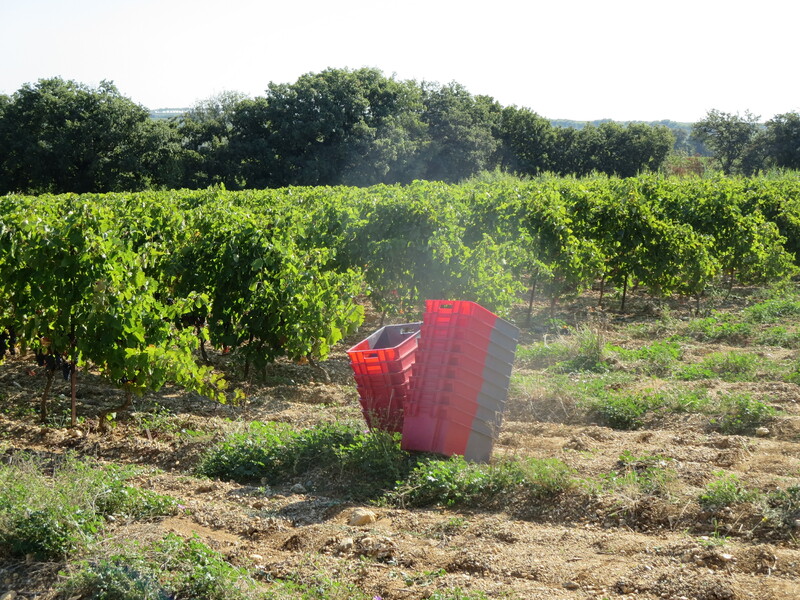 Languedoc producers reacted to this popularity by planting these cépages, it was commercial sense. One of those producers was Jean-Claude Coutelou and Mas Coutelou still has his Cabernet and Merlot parcels. However, one of the more recent trends in the region has been the revival of older and rare grape varieties. 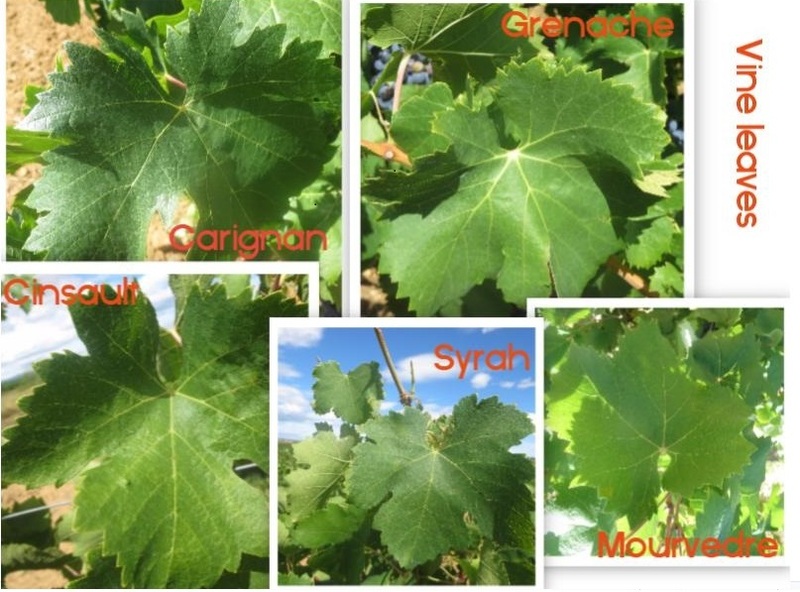 At Mas Coutelou Jeff has planted grapes such as Riveyrenc Noir, Riveyrenc Gris, Morastel, Piquepoul Noir and Terret Noir in Peilhan (see photos below). Earlier this year Jeff received a visit from Domaine De Vassal, guardian of the national treasury of grape vines. They record and keep examples all grape varieties as I described after a visit to Vassal. 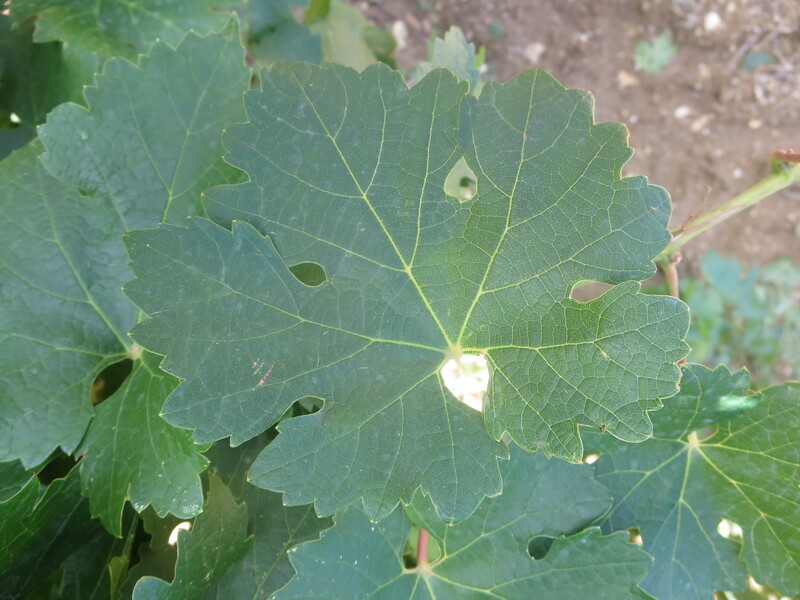 On this occasion they were intrigued by two vines in particular; firstly Clairette Musquée, planted in Peilhan and, secondly, the unknown variety in Segrairals. These are just part of the programme of replanting and grafting which has taken place at Mas Coutelou. The photos below show grafting of other cépages in Flower Power such as Aramon Noir and one unknown variety. 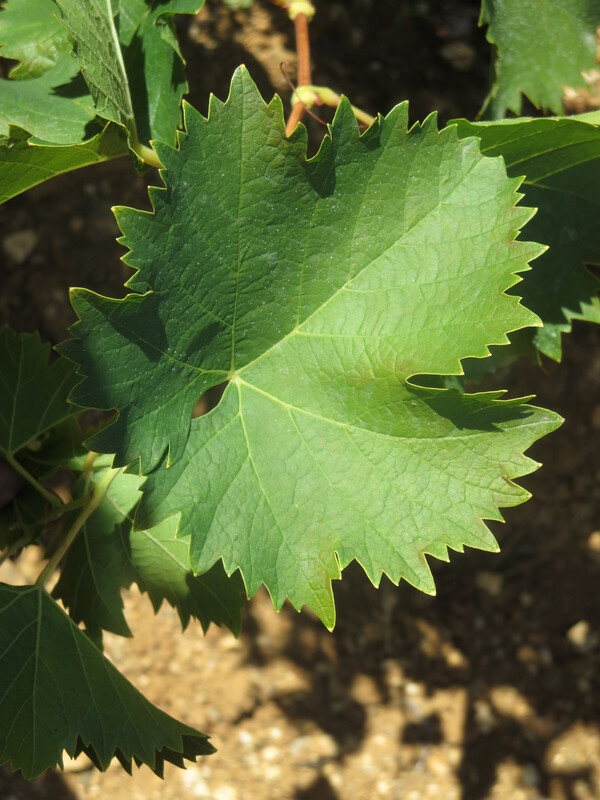 After months of research the experts at Vassal have concluded that Clairette Musquée has its origins in Hungary where it was known as Org Tokosi. It was planted in the Maghreb and after Algerian independence it was probably brought to France by those who repatriated to France. 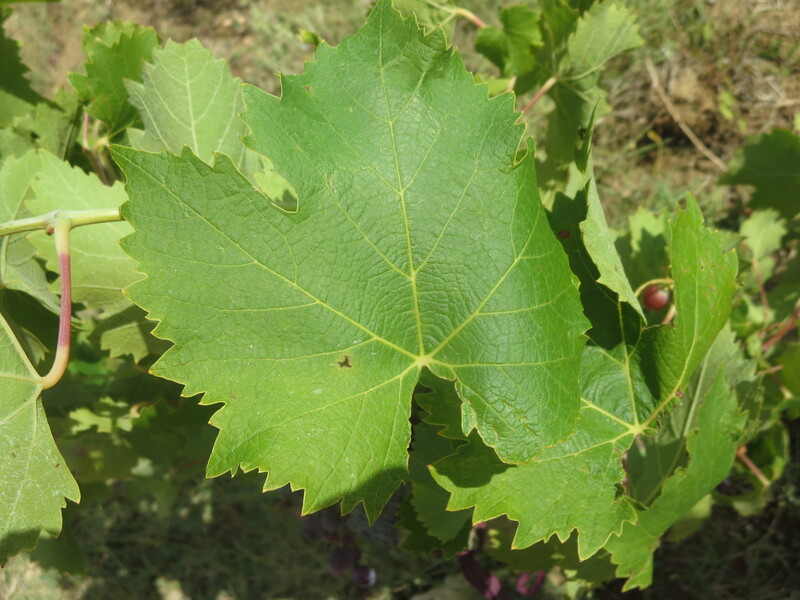 The unnown variety turns out to be an Italian cépage, quite rare, called Delizia Di Vaprio. This is, according to my copy of Pierre Galet’s “Dictionnaire Encyclopédique des Cépages”, a grape authorised in Italy and Portugal. Under the rules of France’s AOC system it would not be allowed. Jeff, however, chooses to issue his wines under the Vin De France label which means he is free to choose his own methods and grape varieties. 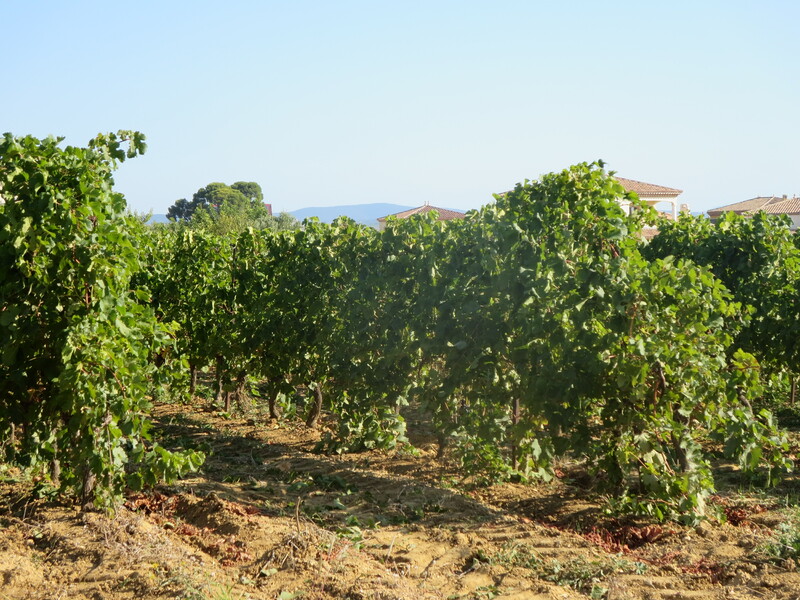 Whereas a Languedoc AOC wine must include grapes such as Syrah and Grenache Jeff can choose what to put in his wines including wines from just one grape variety. It also means he can plant these rare grapes and make wines from them which he truly loves and wants to make. Interestingly one AOC, Burgundy, is starting to show signs of concern that Vin De France is becoming more popular. They have started a campaign criticising Vin de France. To my mind they should be looking to their own failings and regulations. 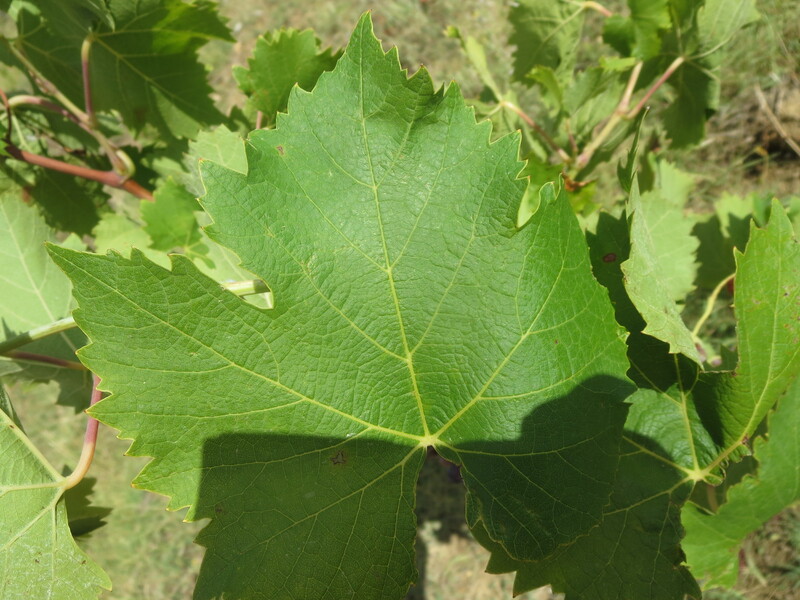 For example, as climate change bites harder vignerons will have to adapt, investigating different grape varieties will be part of that. 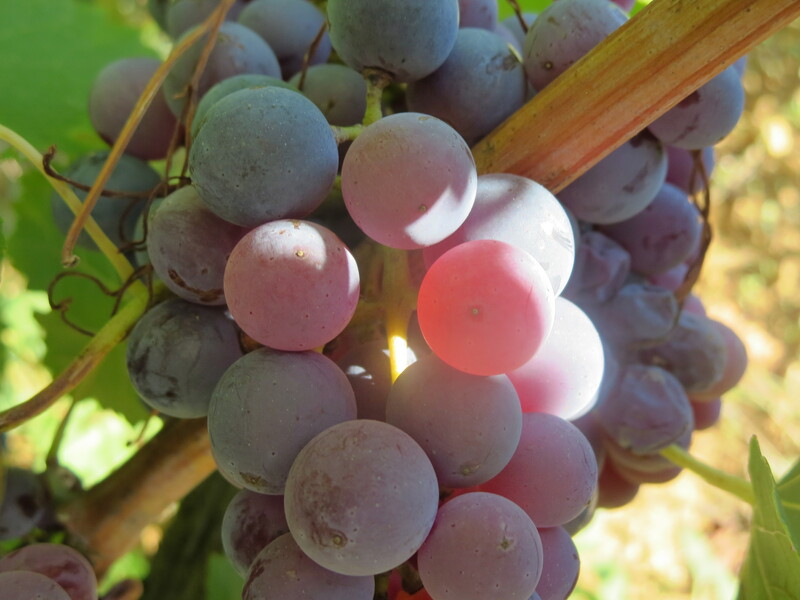 So, yes Merlot has its place (and thrives in the Colombié vineyard in Puimisson) but is it not exciting to see rare, old, traditional grapes being cherished and brought back to prominence? Let us appreciate the range and variety of grapes and the vignerons who bring out their best. Categories: Vignerons, Vines | Tags: Aramon Noir, Clairette Musquée, Colombié, Delizia Di Vaprio, Domaine de Vassal, Flower Power, Galet, Mas Coutelou, Merlot, Morastel, Org Tokosi, Peilhan, Piquepoul Noir, Riveyrenc Gris, Riveyrenc Noir, Segrairals, Terret Noir, Vin De France | Permalink. The storms which brought so much rain to Puimisson and the Languedoc on Saturday meant that there would be no picking on Monday or Tuesday the 14th and 15th. 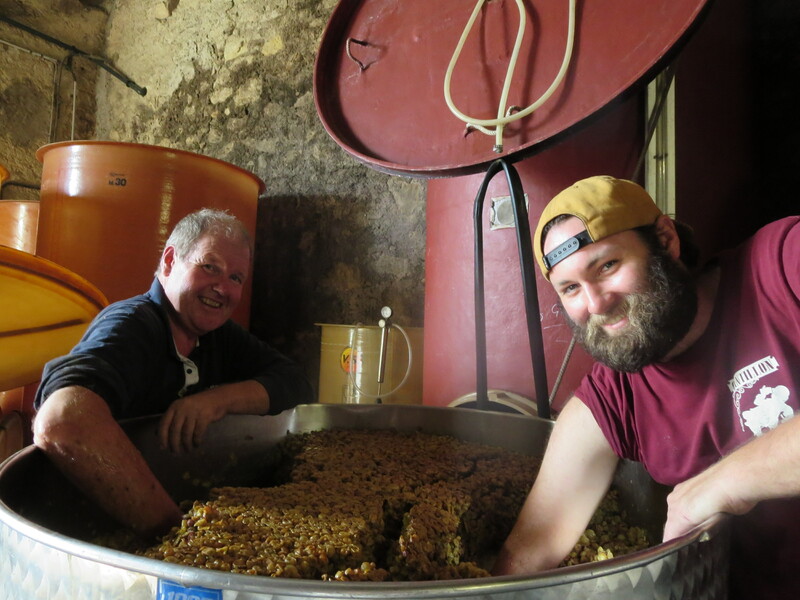 Instead Jeff, Michel and Cameron were hard at work in the cellar for the two days. There is lots to do there so it was an opportunity to get everything on track. Lots of remontage, sous tirage etc. 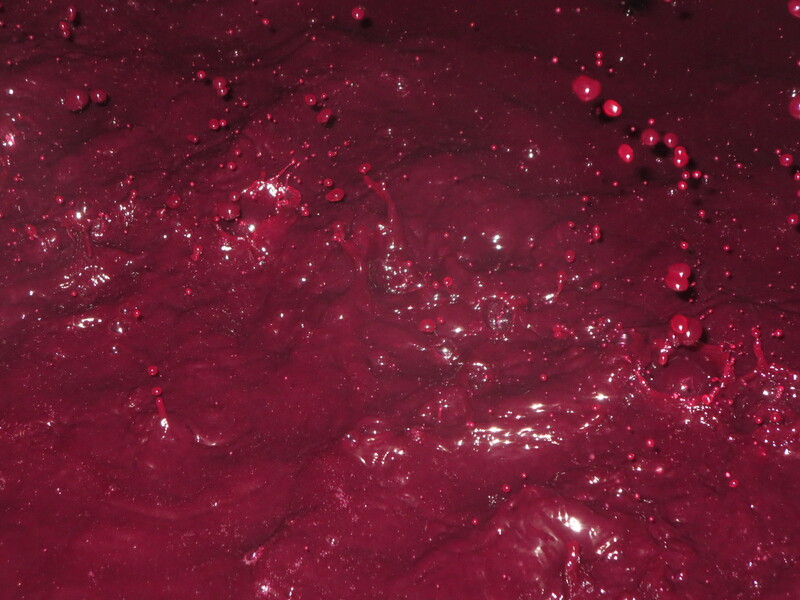 On Monday the 14th the Syrah which was to be made with carbonic maceration was pressed after its few days in tank with the fermentation inside the skins. 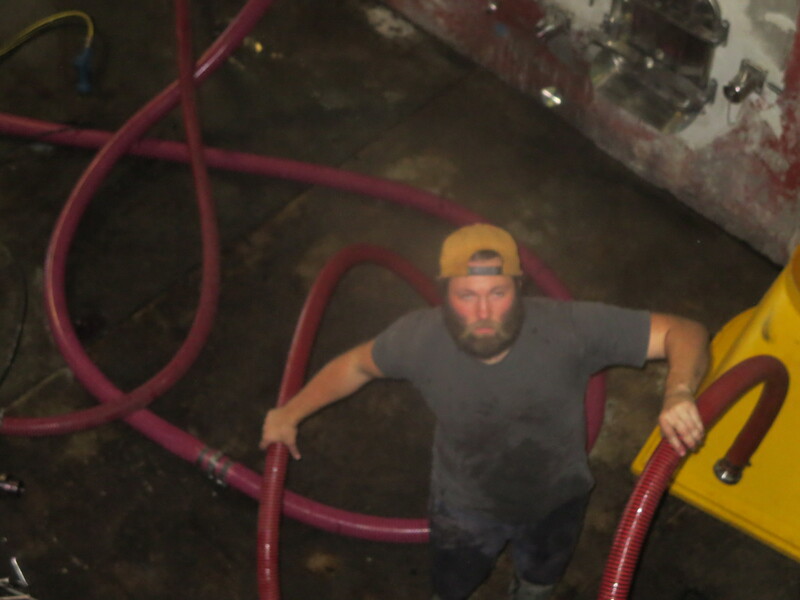 The video shows Michel in the cuve moving the grapes to the front where Jeff forks them into the pump. 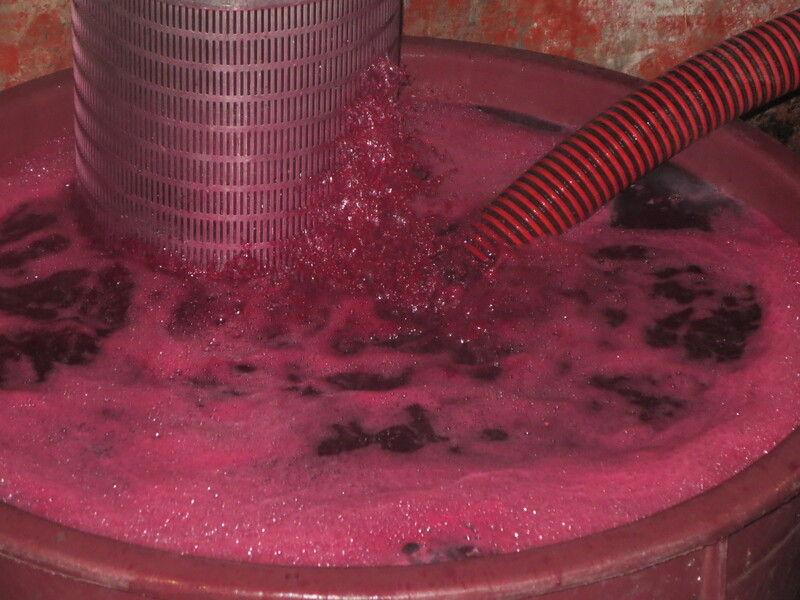 You will see the grapes moving through the pipe into the press. 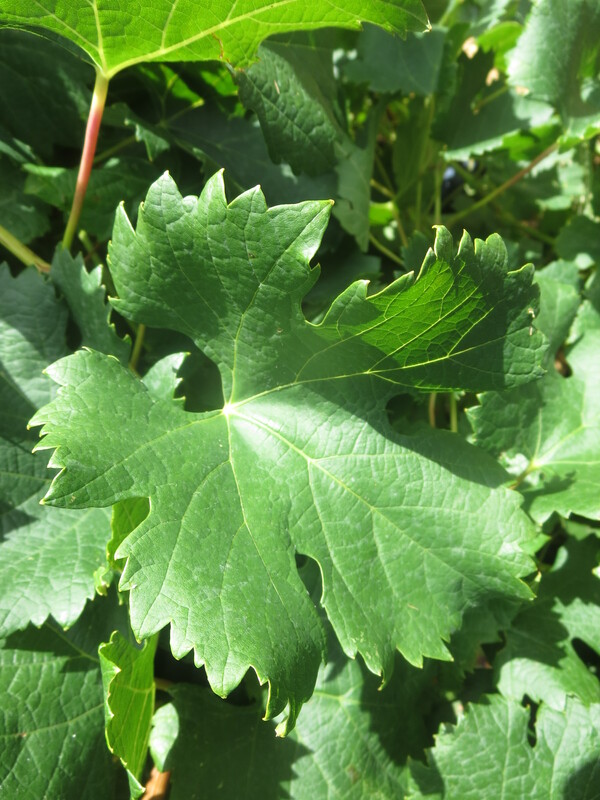 By Wednesday 16th the weather had turned much clearer and good winds meant that the grapes and soil were beginning to dry out nicely and so picking recommenced. The centre of attention was Rec D’Oulette known locally as Chemin De Pailhès and the Carignan grapes which grow there. These are the grapes which make the excellent cuvée «Flambadou», perhaps the outstanding wine of 2013 (and Jeff tells me of 2014 too). 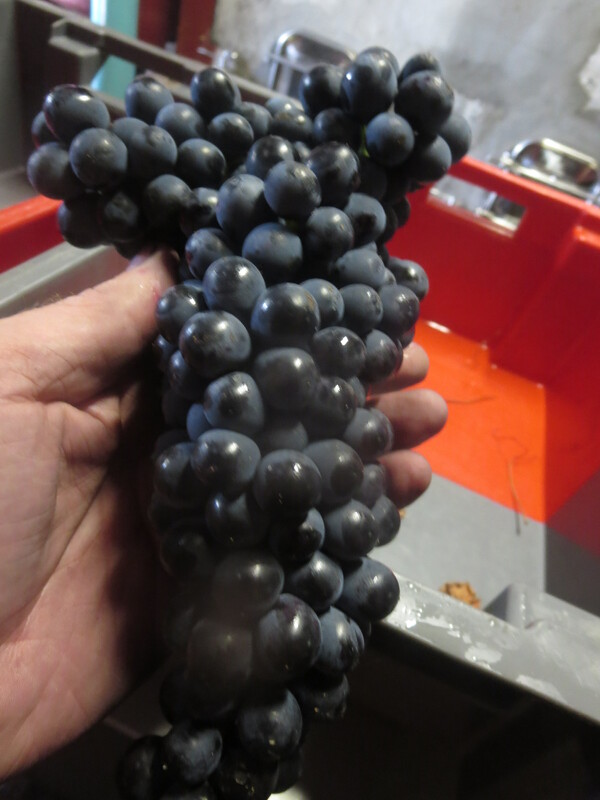 The bunches which arrived were excellent in quality, so fingers crossed for another great wine. 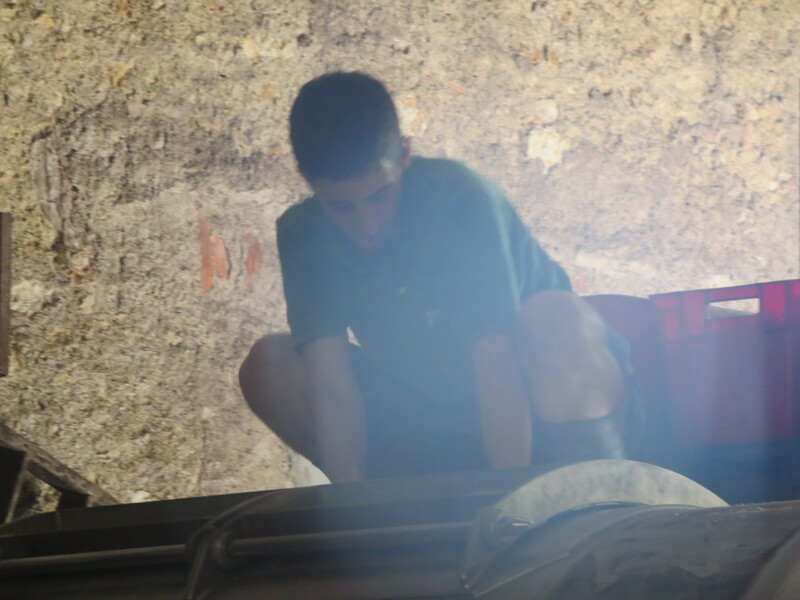 Meanwhile cellar work continued as Cameron carried out more remontages and analyses. 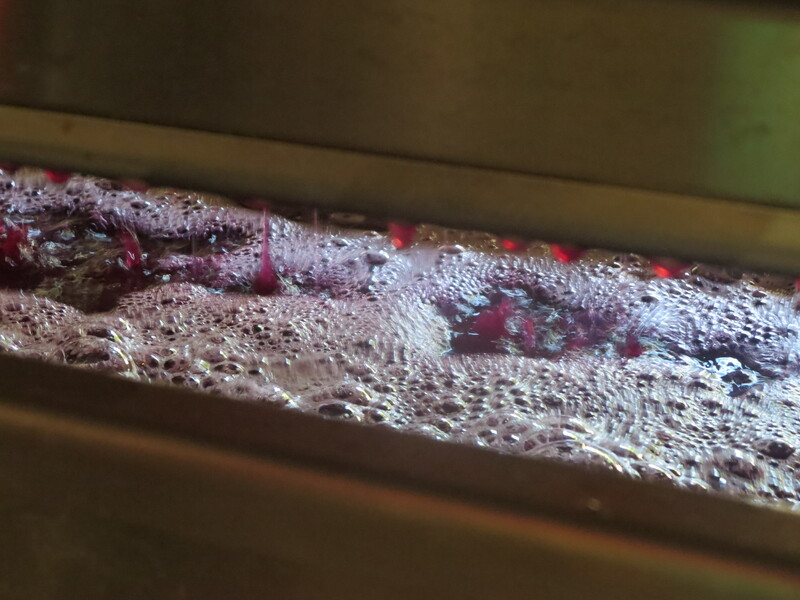 Today one of the wines to be moved was the Merlot which was bright, fresh and colourful. 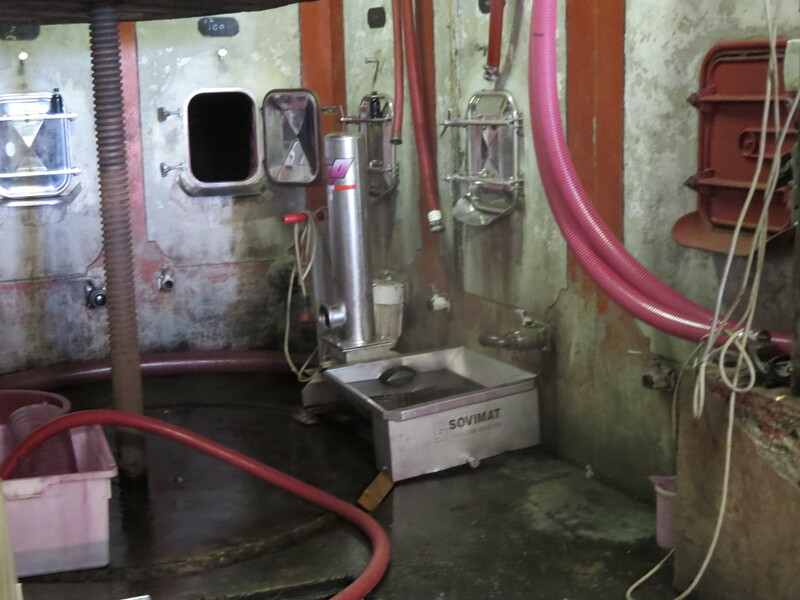 As each wine is moved around the cellar, for example to take it off its skins, each cuve has to be cleaned thoroughly and then it will be filled with another set of grapes or fermenting wine. There is a seemingly never ending merry-go-round of wines and quite how Jeff keeps track of them all remains a mystery to me. 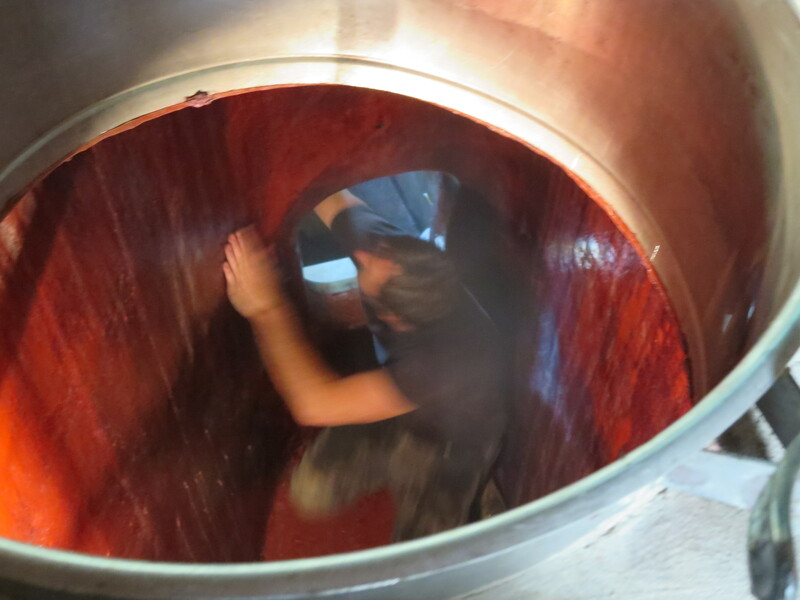 Each move has to be planned to ensure that cuves are available, cleaned and big enough. As a former teacher it reminds me of planning a timetable fitting in students, teachers and classrooms into the correct combination. Add in working as a mechanic to keep all the machines ticking over and the work of a vigneron becomes more complex, the job description is long. 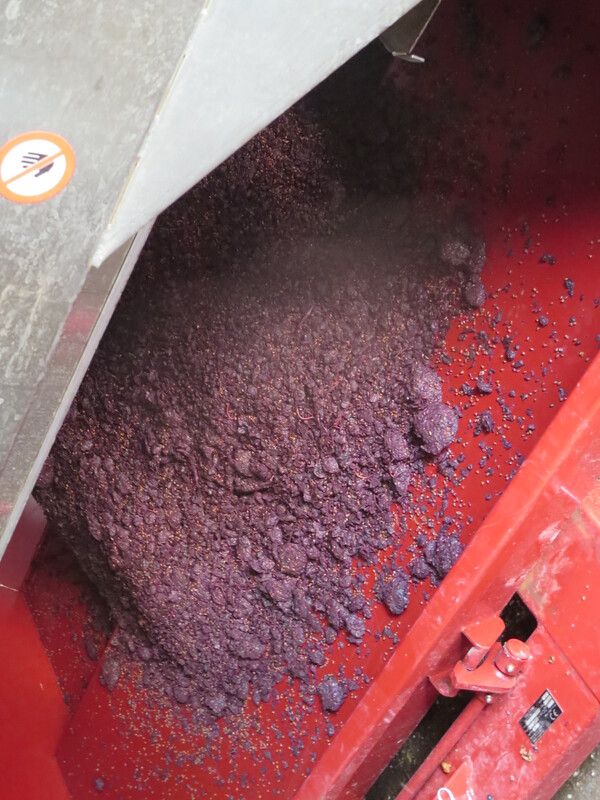 Thursday 17th brought Grenache from Sainte Suzanne (Metaierie), again carbonic maceration was to be used so back to the top of the cement tanks. Thomas was back and he, Cameron and I shared duties up there filling the tank. Then cleaning of the cagettes ready for the next new cépage. 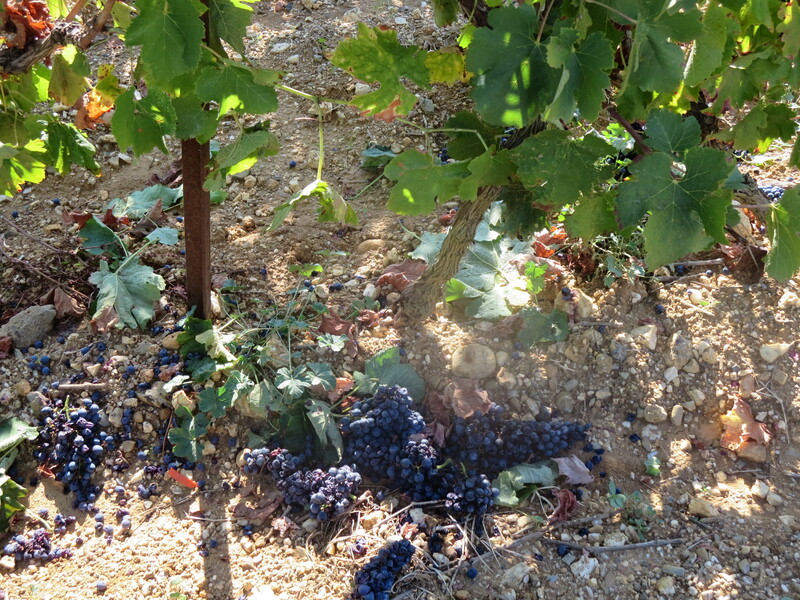 Following the Carignan of Wednesday it was time to harvest the Mourvèdre from Segrairals. One of my favourite grapes, somewhat fickle in character but when grown by good producers it adds a complexity and depth with a hint of dark mystery. 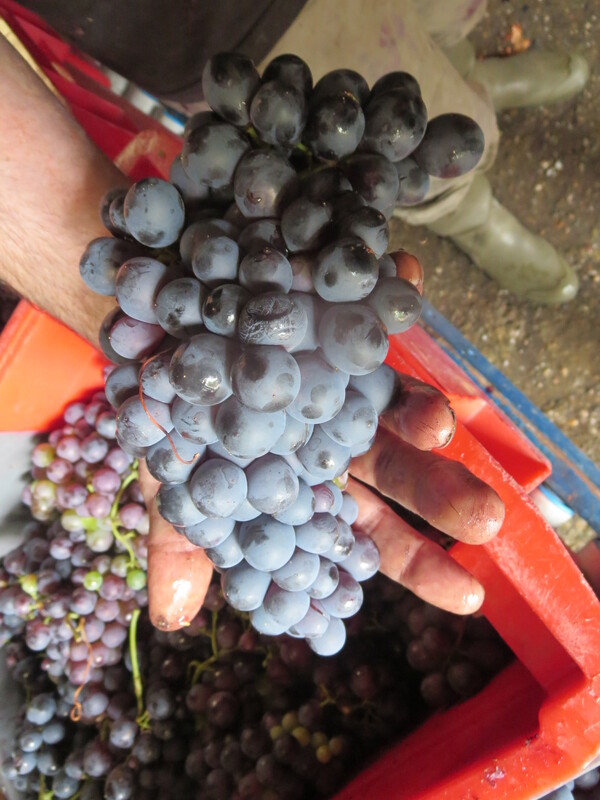 The bunches which arrived were certainly amongst the best of the whole harvest at Mas Coutelou. 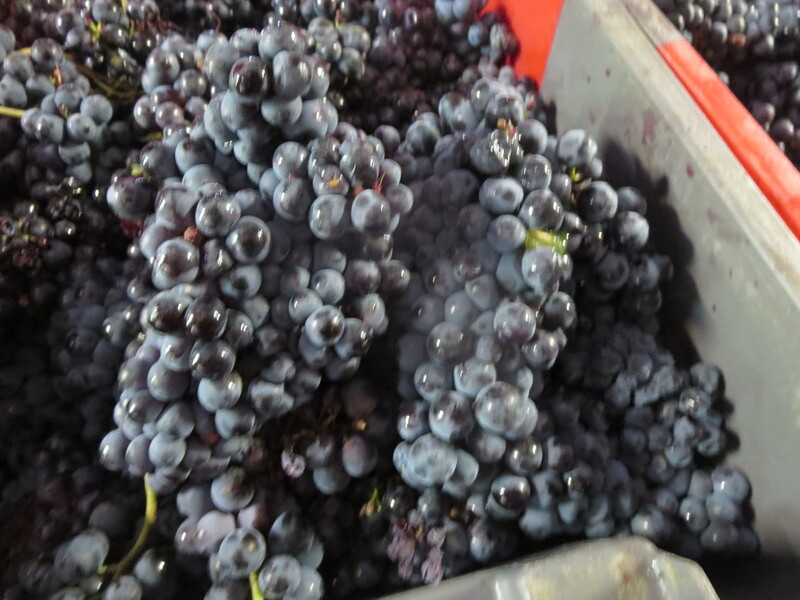 They were clean, big bunches, the grapes with thick skins and smelling already of spice and blackcurrants. 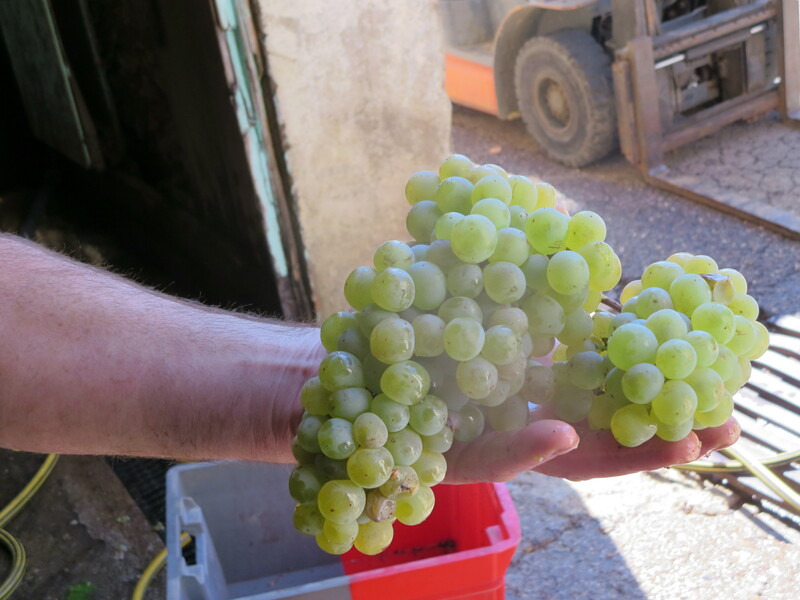 Some of the bunches were very heavy and it wouldn’t take many to produce a bottle of wine, on average you need about 1.25kg of grapes to make the 75cl of a normal wine bottle. Sorting was quick and easy, the pickers had done a good job and the fruit was in such good condition. I look forward eagerly to finding out what Jeff has in mind for these grapes, when I have asked he simply smiles mysteriously, something is afoot! Friday 18th brought the rest of the Mourvèdre still in tip top condition. 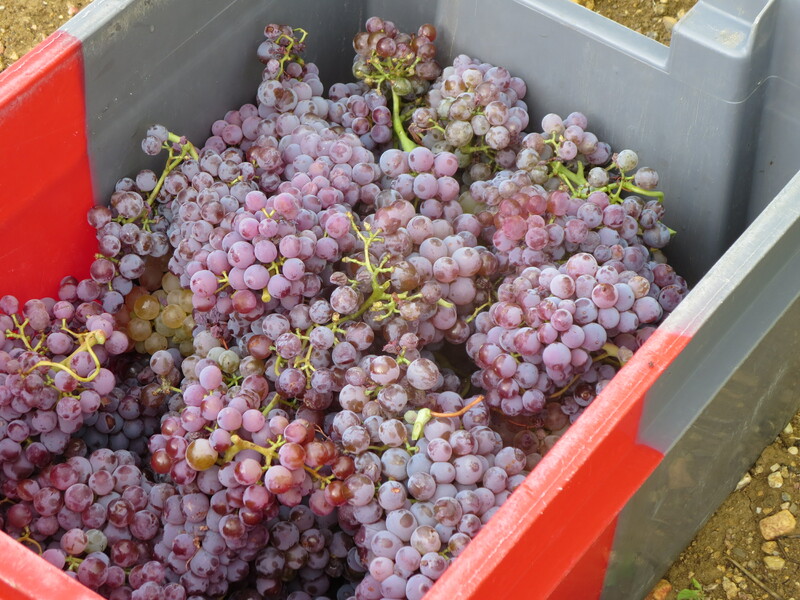 When the pickers reached some of the lower parts of that parcel the quality did begin to dip a little so these bunches were taken away to be used separately, possibly for a rosé wine. I say possibly because final plans are a long way from being ready. 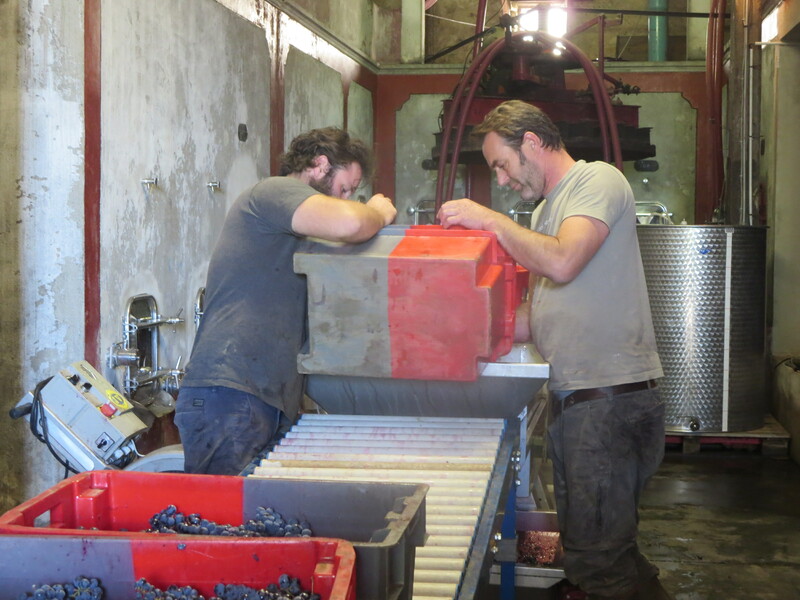 Other jobs included pressing the Cinsault grapes which will make a rosé (definitely!!) and more remontages and analyses. We were joined today by Charles, a young Frenchman who works in a restaurant in Berlin, and whose mother was a former colleague of Jeff when he was a teacher in Paris. Coincidentally his boss in Berlin was a student of Jeff! Charles added a real sense of fun and worked hard. 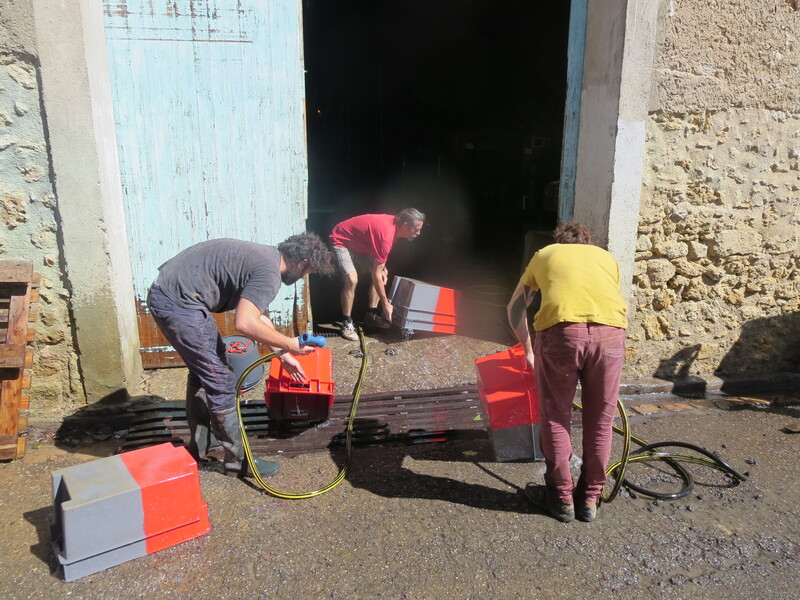 By Saturday I was ready for a rest and so the 19th was the work of the Jeff, Michel and Cameron as they processed the last red grapes from Peilhan. Some of these will be used for blending but amongst them was the famous Castets. This you might remember is a cépage produced by only two winemakers in France, Chateau Simone in Palette and Mas Coutelou. The first harvest was in 2014 and we had watched eagerly its development. In fact we have been drinking some during harvest lunches and it is very promising, brooding with deep, dark fruit flavours and a freshness to lift it. Only 3hl was produced again this year, the same as last year. 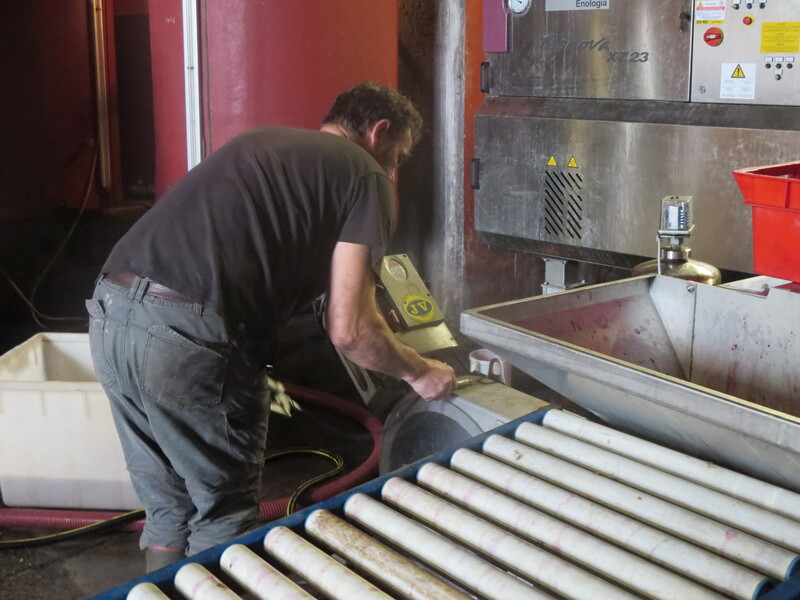 On Sunday 20th Jeff carried out a débourbage of the Cinsault rosé which was pressed on Friday. Débourbage means taking out the pips and skins etc to leave the juice on its own. The harvest is starting to slow down a little though much work remains to be done in the cellar. Jeff and the ‘Coutelou Gang’ will have certainly benefited from a little siesta in Sunday. Categories: Vignerons, Vines, Wines | Tags: Carignan, Castets, Cinsault, débourbage, délestage, fermentation, Flambadou, Grenache, Mas Coutelou, Merlot, Mourvedre, Peilhan, Rec D'Oulette, remontage, Sainte Suzanne, Segrairals, Syrah | Permalink. Wednesday September 9th saw further full on action. 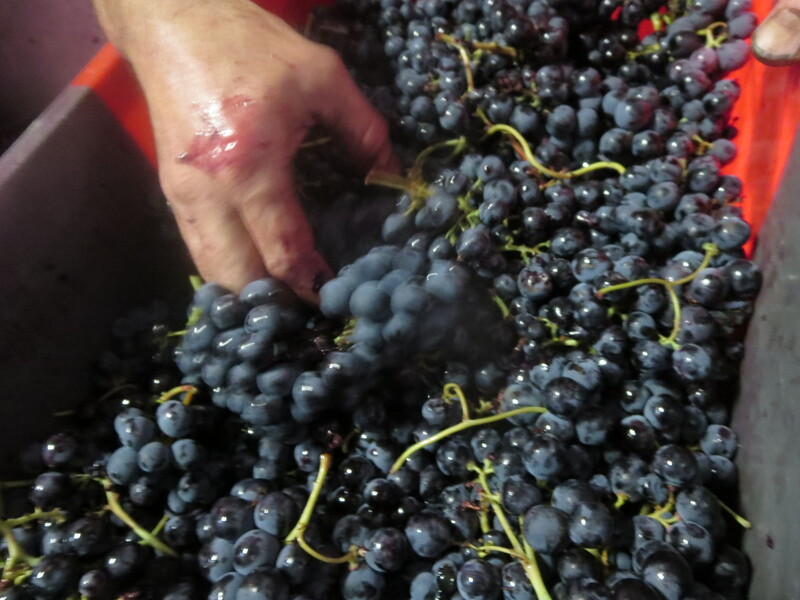 The early morning saw the only machine harvesting of Mas Coutelou grapes. This took place in La Colombié the parcel of Merlot vines. These are grapes that don’t especially interest Jeff in terms of making a domaine bottled cuvée but the quality of the fruit is good and they are used to make restaurant house wines and bag in box wines. After that attention turned to La Garrigue, the conical landscaped vineyard to the south of Puimisson. 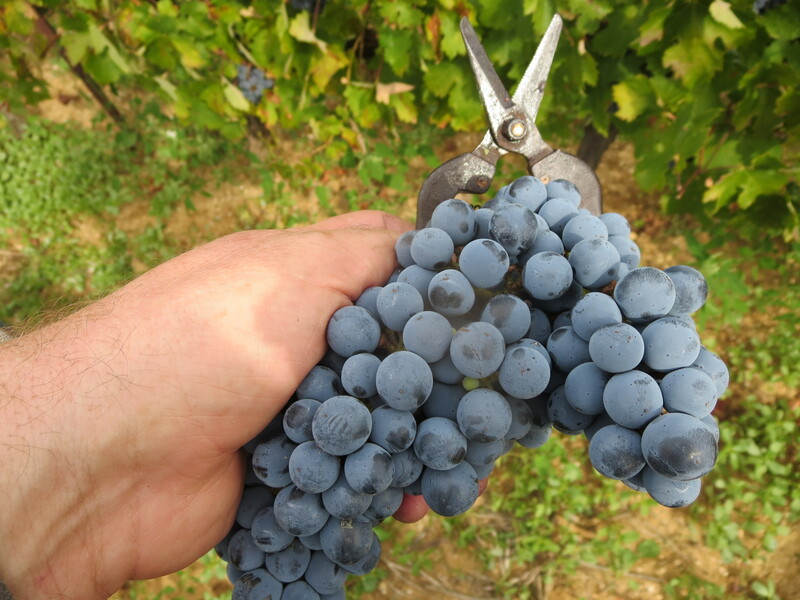 Much of the Syrah had already been picked the previous day and the remaining bunches were harvested. 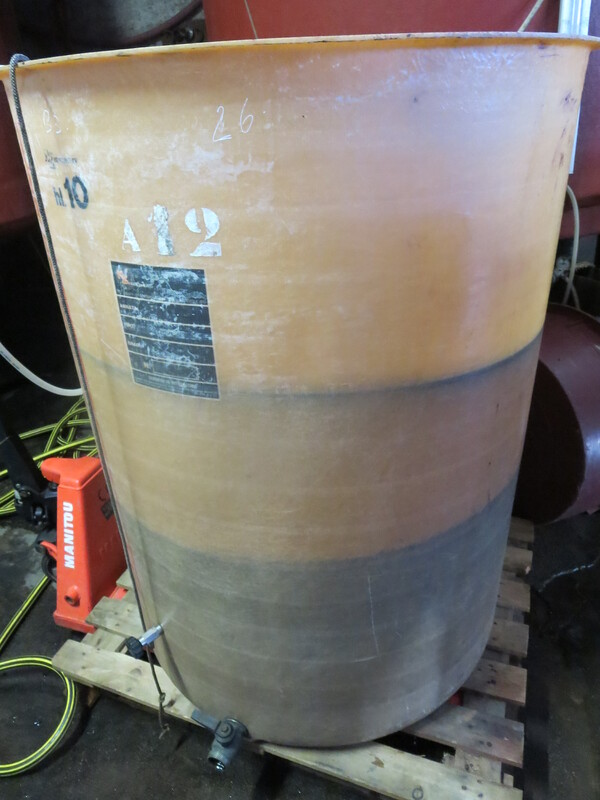 These were to be used for carbonic maceration again and so it was back to the top of the main cement tanks to work, not the easiest place. 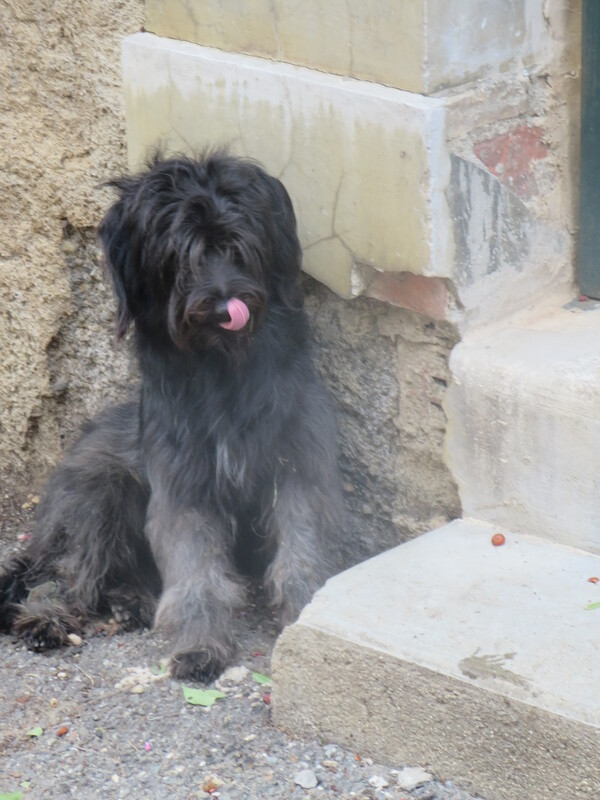 Tuesday had seen the arrival of two new faces to support the team as I described in Vendanges Diaries 4. 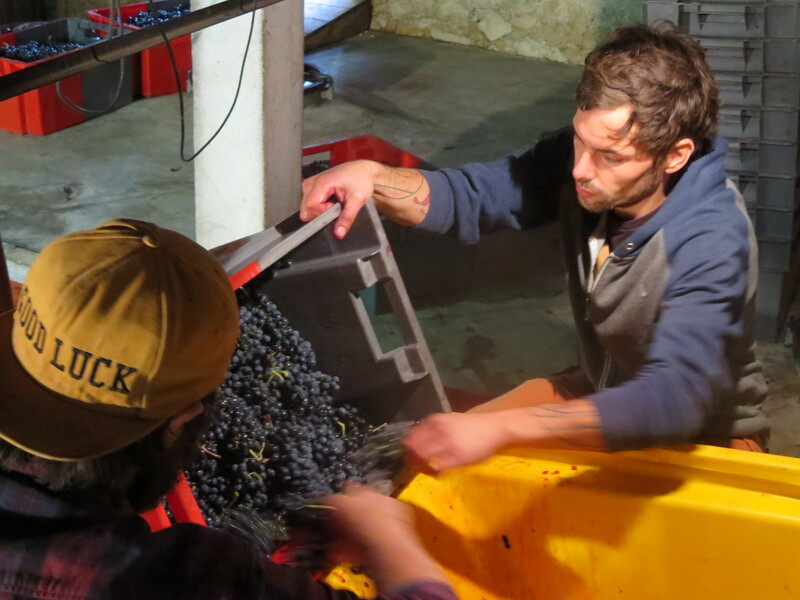 Thomas was working with Cameron in sorting the Syrah whilst Karim assisted Michel in ferrying the cagettes to and fro. 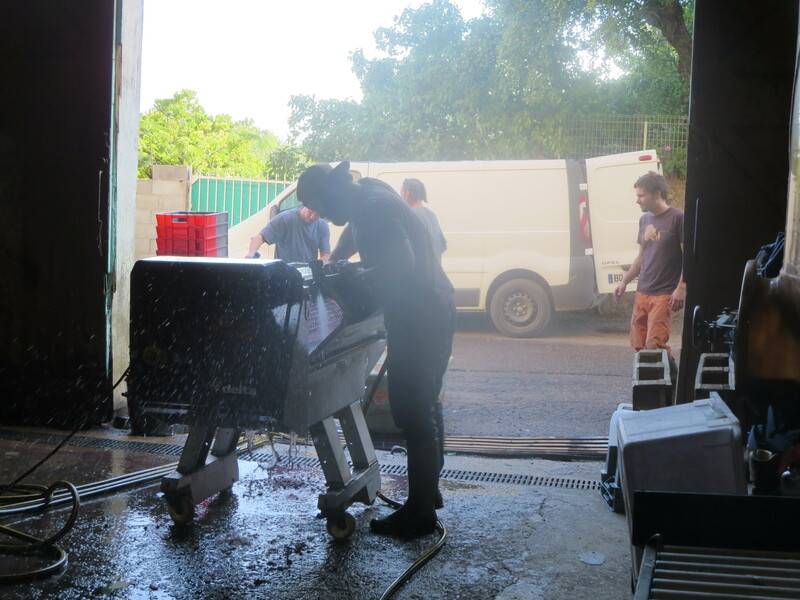 The team usually rotates these jobs so that people get the opportunity to try all aspects of vendanges as well as the chance to stretch your back and legs! 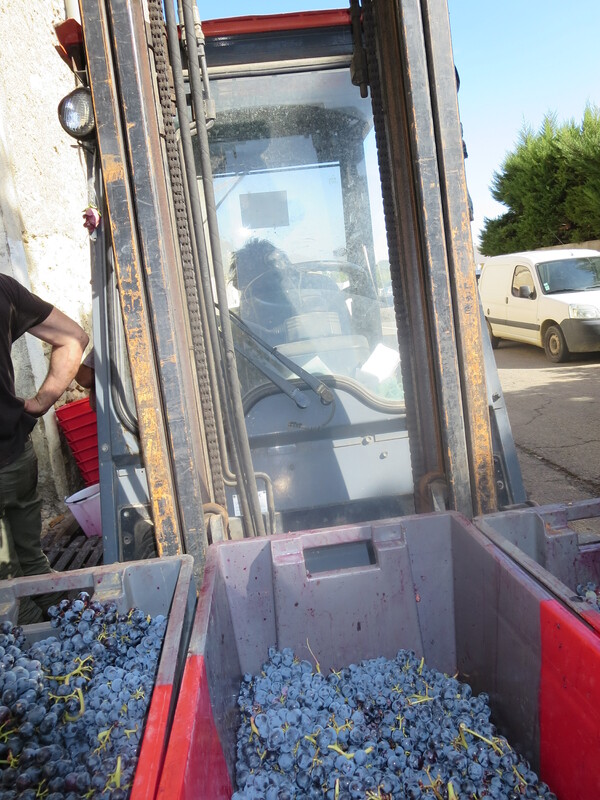 Then it was time to bring in the Grenache of La Garrigue. 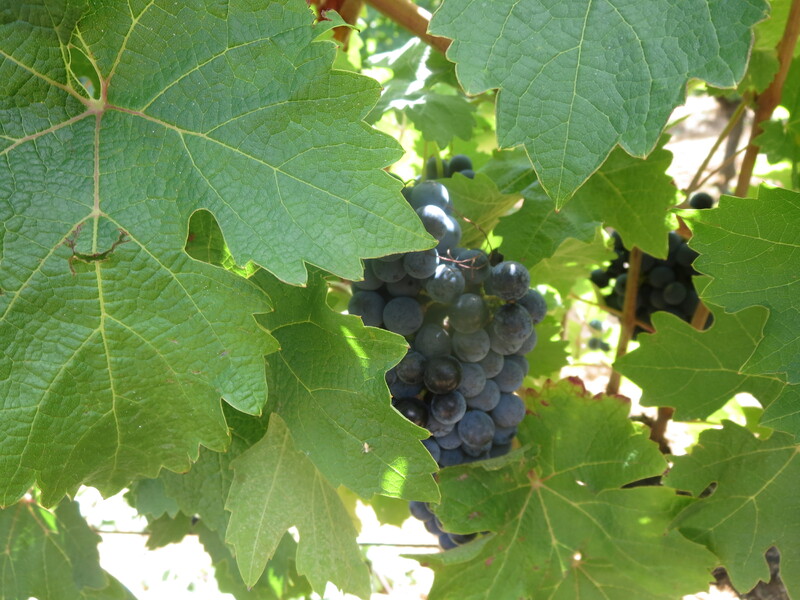 Grenache is a cépage of Spanish origins and loves the heat so it is planted on this parcel on a slope to the south to maximise the sunshine exposure. The result here was some beautiful bunches of very healthy fruit, easy to sort and giving aromas of spice and dark fruits even before it turns into wine. 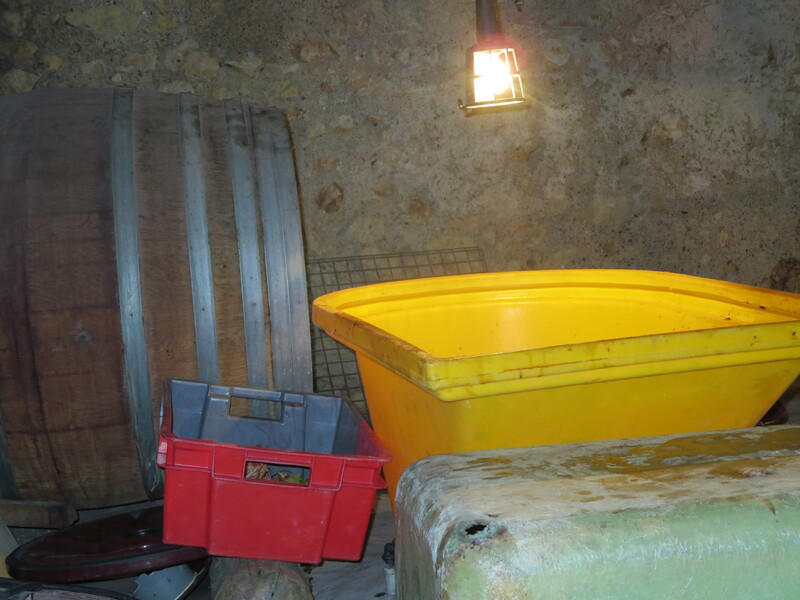 Cellar work continued with Cameron carrying out analyses of the fermenting wines. 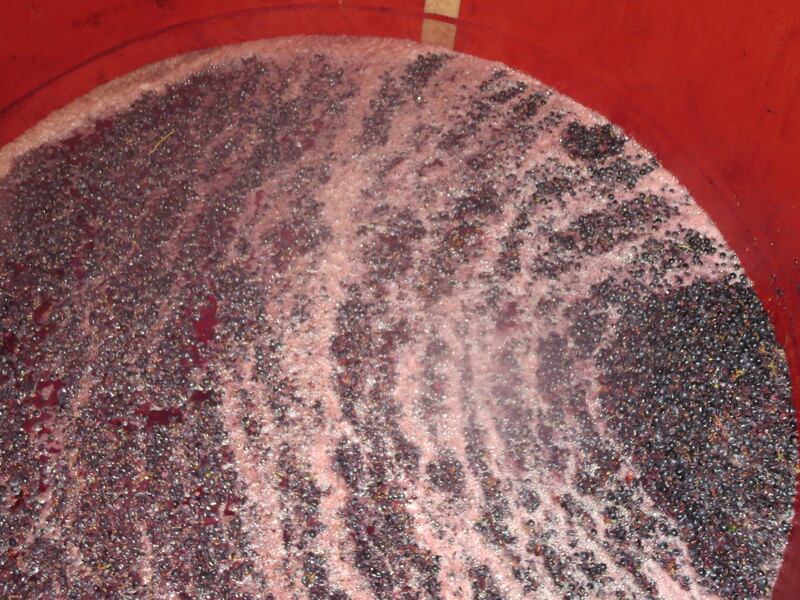 It is worth noting that the natural yeasts of the grapes have been very quick to start fermentation in tank. 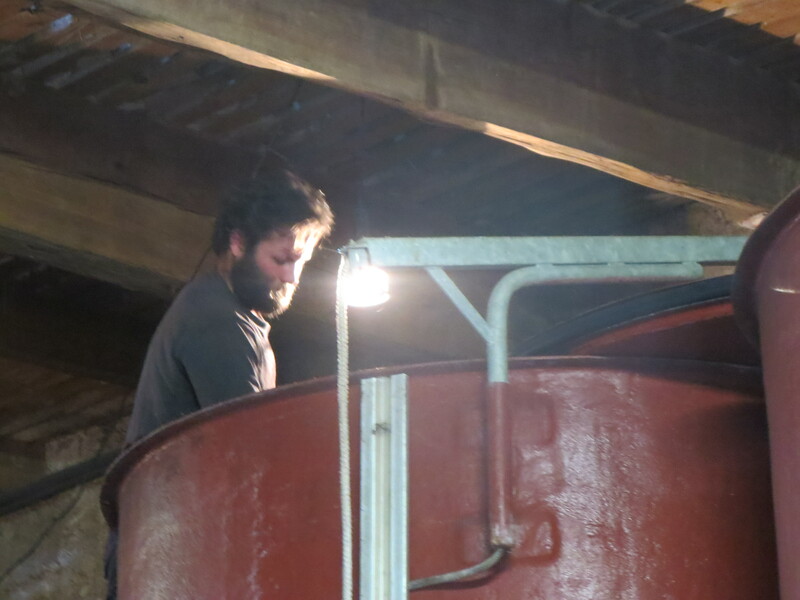 After a couple of hours of crouching over the tanks in the morning I was happy to be stood at the égrappoir and then to help Cameron with remontages. 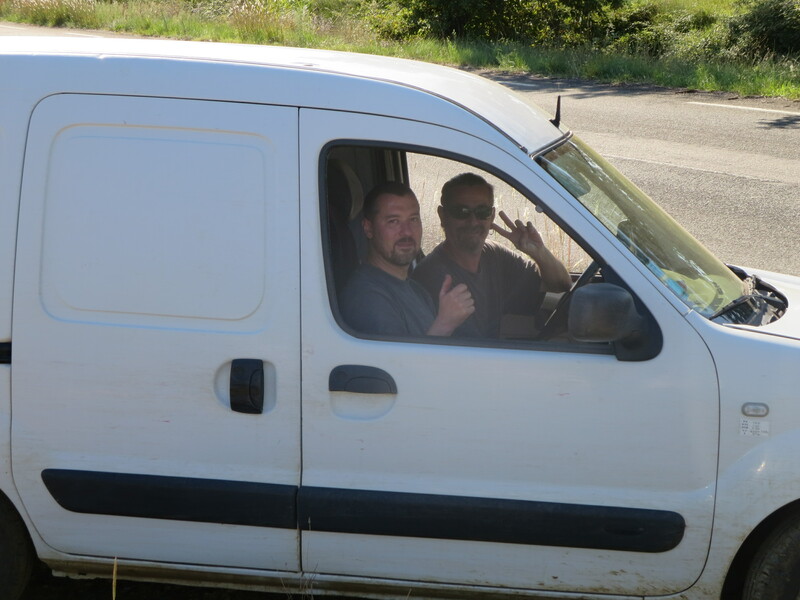 Thursday 11th September continued the harvesting of the Garrigue Grenache and then Cinsault from the opposite end of the village, to the north. More good quality fruit and more hard work from the whole team. The pressure was on however, the weather forecast was unkind with the promise of storms possibly on Friday, definitely by Saturday. Therefore the more grapes that could be harvested before the rain the better. It was full speed ahead though no let up in terms of sorting the grapes and ensuring the quality of the future wines. We were assisted by the arrival of Céline and Delphine the nurses from Bordeaux who I mentioned in ‘Centiment de Grenaches’. There was a famous advert in the UK for tinned fish by a company called John West which said, “It’s the fish John West reject that makes John West the best”. Well that works for Mas Coutelou too. The Moroccan pickers by now were much more attuned to the strict quality demands of Jeff and were sorting the fruit, leaving any substandard grapes on the ground. Then the sorting in the cellar to check anything which did manage to get through that first tri. 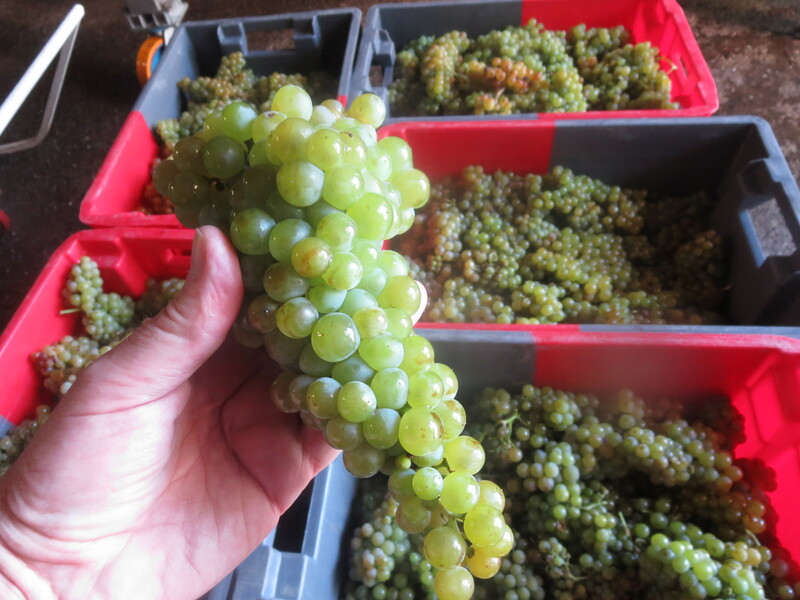 It’s the grapes Jeff Coutelou rejects that make Mas Coutelou the best. Friday September 11th was the day of Centiment de Grenaches, the special cuvée Jeff suggested I make to celebrate the 100th blog post. Meanwhile more Grenache was being brought in for the regular cuvées, work continued apace as the clouds started to gather as predicted. The night of Friday into Saturday brought 45mm of rain (almost 2 inches) as storms rumbled around the Languedoc. Amazingly some areas had next to nothing, Cabrières for example, whilst rain caused floods and the subsidence of the motorway a few kilometres away near Lodève. The 45mm at Puimisson meant 93mm in total since the start of the vendanges. That makes things more difficult of course as water covered grapes can’t be harvested for quality wines (though I noticed some harvesting in some other vineyards!). The ground is also muddy so picking becomes difficult and the biggest issue is the risk of disease and rot. Work was therefore centred in the cellar with more remontages and analysis. 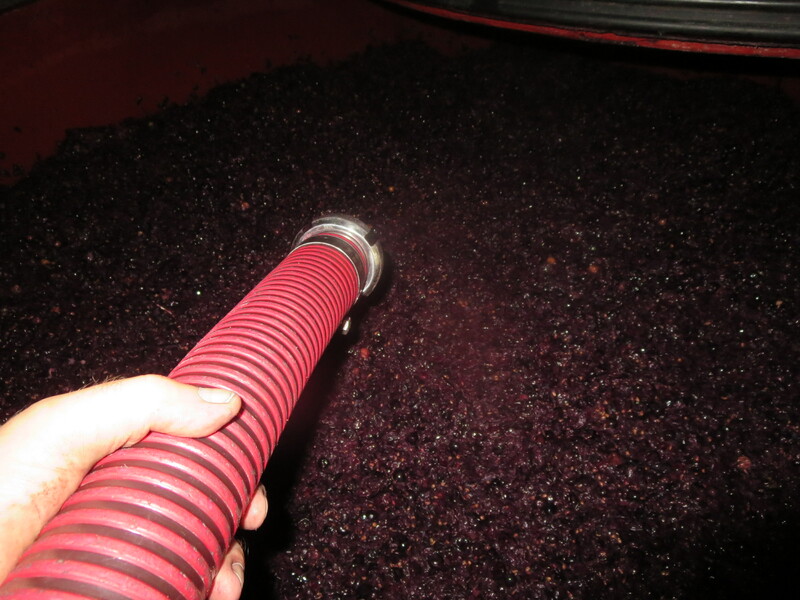 The wines are now settling and need to be moved to take the juice off the skins and pips, to be pressed if made by carbonic maceration, to let them settle. Therefore the 12th and 13th were hard work as usual for Jeff, Cameron and Michel. Though you will see that it is Icare who is driving the team onwards. Categories: Vignerons, Vines, Wines | Tags: Cinsault, Grenache, La Garrigue, Le Colombié, Merlot, Syrah | Permalink.